Observed at a muddy bank of the Sosiani River, Eldoret, Kenya, Dec. 2015. 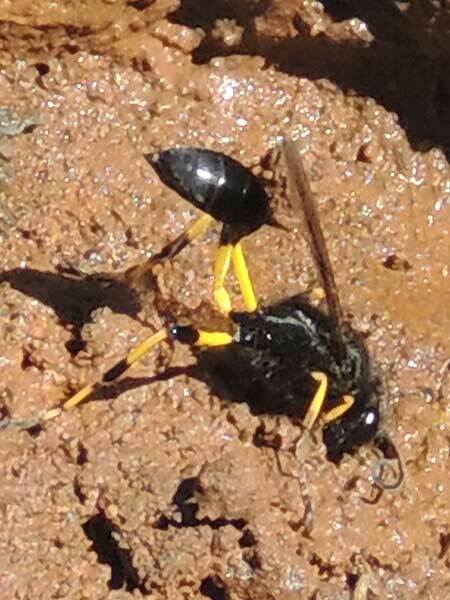 This female wasp is gathering mud from a river bank and will return it to a sheltered overhang (like on a building). The mud will be used to construct tube-shaped chambers that will then be filled with paralyzed spiders. The wasp grubs (larvae), one to each chamber, will feed on the spiders within the cells until they pupate and later emerge as adult wasps. Copyright Michael J. Plagens. Page created 13 June 2016.